Our Homes, Our Voices Week of Action is an effort by the National Low Income Housing Coalition to draw attention to and spark action on proposed funding cuts at the federal level, and the impact these cuts could have on affordable housing programs nationwide. Federal investments in affordable housing have widespread and significant benefits in communities across the country. From employment and economic mobility to health and education, all areas of life are improved when individuals and families have access to a decent, affordable, and stable home. Let's sustain and increase our nation’s investments in affordable housing as a bold commitment to ensure that everyone has a safe, accessible and affordable home. Federal programs that support Habitat's work include Self-Help Homeownership Opportunity Program (SHOP), the Community Development Block Grant (CDBG), the HOME Investment Partnership Program, and the Corporation for National and Community Service. These vital programs allow Habitat organizations nationwide, as well as other organizations, to empower more people to access all-too-rare opportunities for affordable homeownership and help provide the tools they need to build better lives for themselves and their families. In this budgeting season in Congress, Habitat for Humanity of Metro Denver encourages its supporters and all advocates for affordable housing to contact their members of Congress and urge them to support adequate and increased funding for these critical programs in the fiscal year 2018 budget. There has never been a more important time for the American people to stand up for quality, affordable housing. Decent, affordable housing provides the stability individuals and families need to improve their health and education, enhance their financial growth and security, and strengthen their neighborhoods. 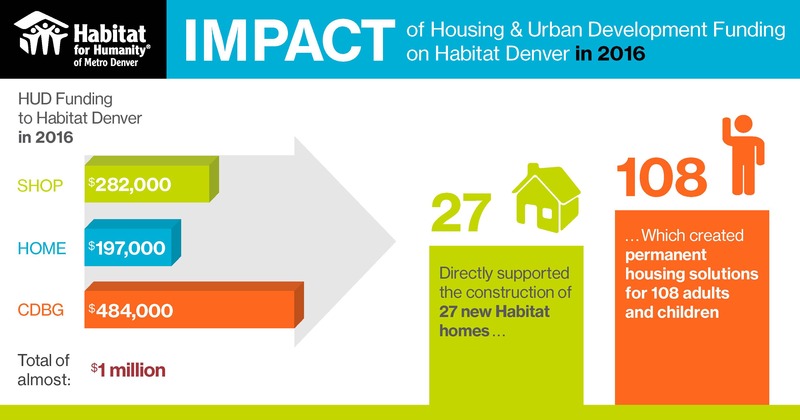 In metro Denver alone, Habitat for Humanity receives approximately $1 million per year in funding from SHOP, CDBG and HOME funds. These funds are a critical investment in the development of affordable homeownership opportunities for low-income families. Additionally, we’re able to leverage the $1 million in annual funding from HUD programs into more than $4 million in private funding to help build and preserve affordable homeownership. Without these proven programs, too many of our neighbors and fellow citizens would be denied access to the tools they need - to a hand up that helps them build better lives. These tangible, practical and fruitful investments play an important role in furthering the reach of Habitat’s work, and we call upon our elected officials to recognize the effectiveness and significance of these programs in communities large and small. For Habitat for Humanity, this is a moral issue, not simply a budget one. Helping more people build and improve decent places to call home only serves to strengthen the fabric and economies of the cities and towns in which we all live and work.